Who is Jason Bay, besides the Red Sox’ new left fielder charged with filling the shoes of a future Hall of Famer? The 29-year-old Bay is a career .281 hitter who gets on base (.375 career OBP) and hits to all fields. He is on pace for a 33-homer, 97-RBI campaign in 2008. 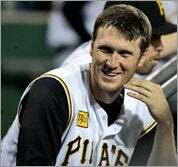 He’s a relative newcomer to Fenway, having played there in 2005 when the Pirates visited for a three-game set. He went 3-12 in that series. Full name: Jason Raymond Bay. He’ll turn 30 on Sept. 20. He’s 6-foot-2, 205 pounds and was born in Trail, B.C., Canada (population 7,237). He and his wife, Kristen, have one daughter, Addison, who will turn 2 in November. His sister, Lauren, is a professional softball player who pitched for Canada in the 2004 Summer Olympics. He is reportedly friends with fellow Trail native and Edmonton Oilers center Shawn Horcoff, and hails from the same town as St. Louis Blues defenseman Barrett Jackman and 408-goal-scorer Ray Ferraro. He played hockey as a youngster, but quit in favor of baseball. Like many Canadian ballplayers, he grew up idolizing Larry Walker, also a B.C. native. He rooted for the Mariners as a kid. He was a member of the 1990 Trail Little League team that represented Canada in the Little League World Series. He played two years at Gonzaga, earning first-team All-West Coast Conference honors as a junior and senior. He was drafted by the Montreal Expos in the 22nd round, 2000. New England connection: He started playing for the Vermont Expos of the New York-Penn League and played two seasons (’99, 2000) for the Chatham A’s of the Cape Cod League. He spent time in A-ball in 2002, hitting for average and power. He was dealt in March of that year to the Mets, who flipped him to the Padres for reliever Steve Reed at the 2002 trade deadline. He made his MLB debut May 23, 2003. His first big-league hit was a ninth-inning homer off of Arizona reliever (and future Red Sox reliever) Matt Mantei. An Elmer Dessens pitch fractured his wrist two days later and was sent to the minors for rehab. He was a teammate of former Sox infielder and current NESN studio analyst Lou Merloni on the 2003 Padres. 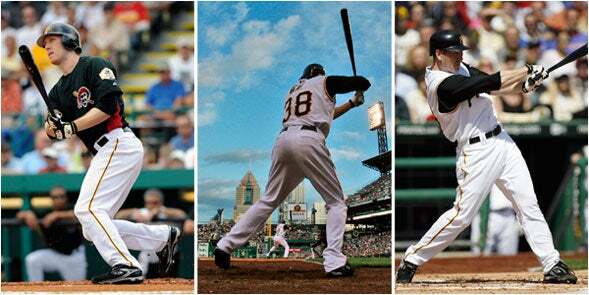 In August 2003, he was traded with Oliver Perez and Cory Stewart to the Pirates for Brian Giles. He finished the year with a .287 average, 4 homers and 13 RBI in 87 at-bats. He reached base safely in his final 14 games, though he was bothered by a torn right labrum that required offseason surgery. After the 2003 season, he signed a one-year, $305,000 contract with Pittsburgh. He rehabbed in the minors until May, then recovered in time to have a breakout season. He hit .282 with 26 homers (a Pirates rookie record) and 82 RBIs that season and was a runaway choice for the 2004 NL Rookie of the Year, the first Pirate to win the award. He had little protection in the lineup, and the Pirates won 72 games. Despite the lack of talent around him, Bay had a monster 2005, hitting .306 with 32 homers, 101 RBIs, 44 doubles, 110 runs and 21 steals, leading the Pirates in every major offensive category. Statistically, it was one of the best seasons in Pirates history. He finished third in voting for Canada’s Male Athlete of the Year in 2005, behind Steve Nash and Sidney Crosby. He signed a four-year, $18.25-million extension in November 2005, receiving a one-year signing bonus. The deal paid him $750,000 in 2006, $3.25 million in 2006, $5.75 million in 2008 and $7.5 million next season. His agent is Joe Urbon, of Octagon Baseball, who played baseball professionally in the Phillies organization and who also represents Cleveland outfielder Grady Sizemore. In 2006, he established career-highs in homers (35) and RBIs (109), hitting in a lineup with current Sox first baseman Sean Casey. He hit 10 homers in a 10-games span in May and had 20 bombs at the All-Star break. He rode the hometown vote to the 2006 All-Star Game, held in Pittsburgh. The Pirates staged an aggressive marketing campaign to get Bay votes, and Pearl Jam lead singer Eddie Vedder urged fans to vote for Bay during a late June concert at Mellon Arena. Bay was sheepish about the publicity, saying that the attention was “very flattering. I never would imagine I’d be in this position with the names that are out there.” He went 1 for 3 in the All-Star Game. He declined to appear in the Derby. He was troubled by knee problems all season, usually icing it after games. In late November, he had a quick, 10-minute arthroscopic procedure to relieve irritation in his right knee (he walked out of the hospital). In 2006, he represented Canada at the World Baseball Classic, leading his team to opening-round wins over South Africa and the US before they were crushed by Mexico. Last season, he again led the struggling Pirates by hitting 21 homers and driving in 84 runs. He shared the team lead in homers with Adam LaRoche, the brother of then-Dodgers third baseman Andy LaRoche, who went to the Pirates in today’s deal. He played in 15 of Pittsburgh’s 28 games in September due to tendinitis in his right knee. He made 142 starts in left field and despite an average (at best) arm, Bay ranked third among NL outfielders with a career-high 13 assists. Manny Ramirez had 8 assists in 2007. In addition to left, Bay has played center field in the past. He spent time DH’ing in the minors. He strikes out more than the average hitter, averaging 153 whiffs over a 162-game season. He is on pace for 130 this season. He averages 84 walks per 162 games, with a high of 102 in 2006. He’s not exceptionally fast, but is an intelligent base runner — his steal-to-caught stealing ratio is 50-11 for his career (caught four times over the past four years). This season, Bay is batting .282 with 22 homers and 64 RBIs while playing in all but two of the Pirates’ games. Super important stats: Bay is hitting .421 lifetime (8-19) against Andy Pettitte, .429 (3-7) against Mike Mussina and .500 (1-2) against Joba Chamberlain. He wore No. 38 for the Pirates and No. 2 for the Padres. Curt Schilling said today he would give up his No. 38 — for a fee, which would go to Schilling’s Curt’s Pitch charity.